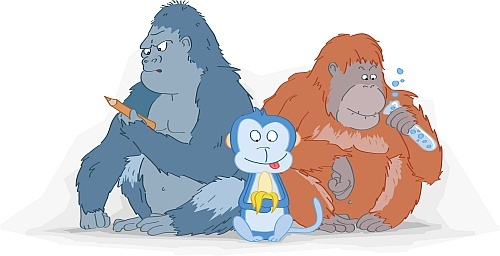 Dr Jennifer Vonk is the author yesterday’s article “Matching based on biological categories in Orangutans (Pongo abelii) and a Gorilla (Gorilla gorilla gorilla)” which received quite a bit of attention in the press. Dr Vonk is a comparative/cognitive psychologist with primary research interests in two overlapping areas: (1) animal cognition, and (2) cognitive development. The underlying goal of her work is to examine cognitive continuities and discontinuities between humans and both closely and distantly related species. 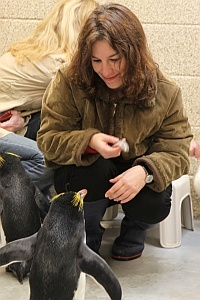 Thus, her work focuses on examining both phylogenetic and ontogenetic origins of cognitive processes thought to be unique to humans. PJ: Hi Jennifer, can you tell us a bit about yourself, and what fascinates you in working with primates? JV: I first became fascinated with orangutans when I came face to face with one (with glass between us of course) in a small zoo in Holland while visiting my grandparents. I was enthralled by how the orangutan reacted to my stare – becoming angry when I was too transfixed to look away. The large male orangutan was always my favorite animal at the Toronto zoo, which was the most exciting place in the world for me to visit. I felt incredibly fortunate to be able to interact with him and his group-mates many years later. In fact, he (Dinding) is one of the subjects of the current study. In truth, I am fond of all animals and have wanted to build some kind of career working with animals ever since I can remember. I was turned off of veterinary work because I am squeamish and worried about my ability to be detached. So – instead I pursued psychology where I fell in love with the experimental side of psychology. As an undergraduate student at McMaster, I took a class in animal behavior and was so excited to realize that I could still work with animals with my psychology background without doing any invasive work. Research in comparative cognition perfectly blends my interests in psychology, biology, philosophy and anthropology. Primates are not my only interest – but because of their similarities to humans, they are, in some ways, easier to study when one is interested in questions of complex cognition. PJ: Can you tell us about the research you published with us, and why it is interesting? JV: My primary interest was in answering questions about whether non-humans could form ‘abstract’ concepts –meaning that the concept entailed that item belongingness depended upon more than physical (and observable) attributes. The thinking was that non-humans should not form such concepts because they are dependent upon language. For instance, we can’t think about traits that make a good romantic partner (unobservable qualities such as kindness, sense of humor) without words or labels to describe those traits. Of course it’s hard to test the presence of such concepts in non-verbal organism because our methods of testing their categories involve visual stimuli, such as photographs. But the idea was to look at the extent to which physical similarities determine the ease of category acquisition. The research shows that non-human apes can form natural categories both when items in the categories look very much alike and when they look dissimilar. Surprisingly little work has been conducted in this area with non-humans although there is a lot of research examining the development of such concepts in human children. So the study allows somewhat of a comparison between natural categories held in human children and in other apes. Orangutans and gorillas are not tested as often as chimpanzees in these types of studies so it is important to gauge their abilities as well before generalizing that chimpanzees represent all apes. One of the other aspects of the study that I found important was the finding that apes could rapidly reach above chance performance levels on a match to sample task despite not having been extensively trained on identity matching. This suggests to me that animals may sometimes be overtrained to focus on perceptual similarity and this may detract from performance. PJ: Why did you choose to publish this research in PeerJ? JV: I had recently reviewed an article by a colleague that I respect and decided to investigate the journal further. I thought it was a good outlet given that the research had relevance to biologists as well as psychologists and I like the idea of open access outlets with a broad scope. PJ: You have published in several well-established journals in the past. What opinion have you formed about the publication process in general, and how would you compare it to your PeerJ experience? JV: I found the submission process a bit difficult at PeerJ. The platform did not work well with internet explorer and I found it odd to omit the title, abstract etc. from the main document so the process was a bit more onerous than I would like. In addition, I am not accustomed to all of the permissions statements etc. However, having submitted, I was pleased to receive reviews very quickly and to receive feedback on the revision even more quickly. The editor and assistants have been extremely pleasant to interact with and their excitement for the journal is refreshing. PJ: If you could share more details, how would you describe your experience with our submission process? JV: Frustrating at times but, in the end, rewarding. PJ: Were our author instructions and policies clear to you? JV: They were fairly clearly laid out although I was a bit uncertain of some unusual aspects of the process. PJ: What was your experience of the review process, and why did you choose to reproduce the complete peer-review history of your article? JV: I value transparency in the process and I think it’s nice to credit reviewers for their input. Also, the reviewers were quite positive so I did not feel embarrassed to have them made public. PJ: And what was your experience of the production process? PJ: What is your opinion on the overall speed of the process? PJ: And was there anything that surprised you with your overall experience with us? JV: I was pleasantly surprised to have my article considered for a press release. PJ: What do you think of the HTML view of your published article and the appearance of the PDF? JV: Both look very nice. PJ: What is the audience that you wish to reach publishing with us? JV: Ideally I would reach a broad audience with interests in animal behavior and cognition, broadly defined. This might include biologists, anthropologists, zoologists, as well as comparative, developmental, and evolutionary psychologists. PJ: Does the fact that we are an Open Access publisher help with exposure and media coverage at all? JV: I would assume so. Many universities do not provide access to journals in the area of comparative cognition. PJ: Today, publishing in a “top journal” is still considered a “stamp of approval” for funding agencies. In your opinion, are your funding bodies supportive of Open Access and PeerJ? JV: I think they should give their emphasis on broader impact; however, I do think that opinions of journals still rest heavily on impact factor. PJ: Did you get any comments from your colleagues about your publication with PeerJ? JV: Colleagues were interested to hear more about the journal. Most of them had not heard of it. PJ: Would you recommend them to submit to PeerJ? JV: Yes, although it would be better if PeerJ also covered social sciences, as in other areas of Psychology. PJ: And of course, would YOU submit again to us? PJ: In conclusion, how would you describe PeerJ in three words? PJ: Thank you for your time! PeerJ is currently getting first decisions back to authors with a median time of 24 days, and we have hundreds of highly satisfied authors. If you would like to experience the PeerJ process for yourself, then submit your next article to us!